All eligible organizations, including current grantees, must first submit a Letter of Inquiry (LOI). After RMSFF staff review the LOI, you may be invited to submit a full proposal. Please submit all materials through the Foundation’s online application portal. 1. Access our online portal and submit a Letter of Inquiry (LOI). If you have an account, login using your email address and password. If this is the first time you've applied, you'll need to create an account. If you cannot provide “yes” answers to the eligibility questions, do not submit an LOI. If you can answer “yes” to the eligibility questions, complete the form and submit by LOI due date below. 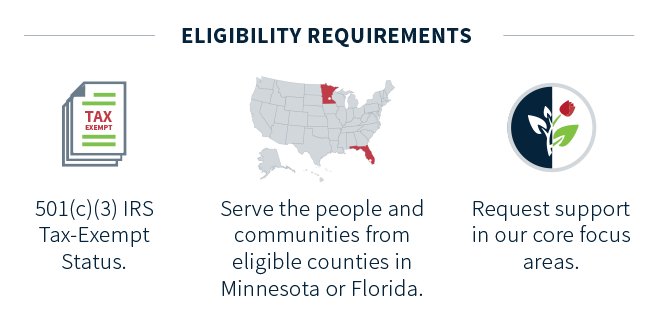 Proposals for counties outside Minnesota and Florida counties mentioned above are by invitation only. 3. You'll know within 14 days whether or not to submit a grant application. *The RMSFF Board of Trustees makes funding decisions twice a year in the spring and in the fall. An invitation to submit a grant application does not guarantee funding but indicates we'd like to learn more about your organization and your funding request. **If you are a Spring 2018 grant recipient, your six-month check-in report was due Nov 9, 2018 and, with a few exceptions, your final report is due on Apr 1, 2019 and will inform our final Spring 2019 recommendations to the board at their Spring 2019 meeting. If you are a Fall 2018 grant recipient, your six-month check in report is due Mar 29, 2019; your final report, with a few exceptions, is due Aug 30, 2018.